Who is Jim Walker, The Hack Repair Guy? Fixing Hacked Websites Full-time – It’s What I Do. Having spent nearly two decades helping folks build websites and managing a security-oriented website hosting business, it dawned on me late-2008 that I could use those same skills to help those whose websites have been compromised by hackers. 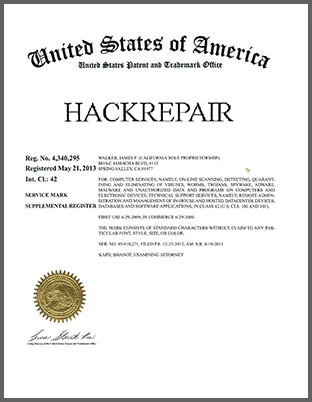 Something of a labor of love, HackRepair.com was born as a helpful thought, which became the service you see here today. I bring to the table the ability to quickly unpuzzle complicated website issues and communicate complicated technical issues in a human way. I actually enjoy talking to people by phone (what a crazy concept!). The digging into and figuring out the how and why a website was compromised is my idea of fun. Some people like solving crossword puzzles. I enjoy un-hacking websites. Many quality website hosting companies recommend our services as well. IT people like Jim just don't exist!!! He personally took care of what could have been a major disaster for my Web Design business when an exploit appeared in one of the plugins I use on EVERY site. He fixed every instance at VERY reasonable rates and kept me posted every step of the way. I can't recommend him strongly enough!!! 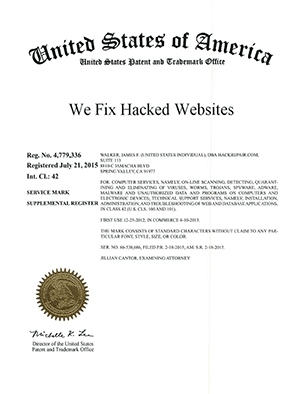 From the depths of my web defeat, HackRepair brought me into the heights of web wellness. Pardon all the mixed allusions - the upshot is, his work was great, quick, inexpensive and thorough. I guess you can say, I trust him and will go from "rescued by Jim" to "hosted by Jim" ASAP. Thanks. Jim did such a great job, he helped me not once but twice. I had a virus that Sitelock was going to charge me an arm and a leg for and Jim did more efficiently, quickly, and for leff than half the price. After all the little things he did to help then, I moved my website over to his hosting, and one again, quick and great service. I love that when you call, it is him himself who answers the phone, that's the quality help that you are getting. 100% reccomend, I wish I had known about him sooner. Jim did a great job with my websites. I would definitely recommend him. Jim was SPECTACULAR to work with! I cannot say enough about his services and his outstanding, personable, customer service. Literally lifted a HUGE weight off our shoulders!! After spending countless hours calling to the domain/web hosting company (GoDaddy) & waiting 2 days without it being fixed, researching YT tutorials and reading forums on how to fix a hacked website, we weren't confident it could be fixed... All leads were leading to a dead end, which didn’t give us much hope it could be reversed. GoDaddy knew what the problem was, but couldn't provide a solution... (frustrating!) So, I took my brothers advice on website hackers and did some research and found Jim! H.A.L.L.E.J.U.L.A.H.! Distressed and uneasy about the situation... I explained what I did know (which wasn't much), and the importance of getting it fixed FAST as my fiancé is an SMB owner, and has little-to-no-time to spare as it is… Jim instantly and calmly eased my nerves. His professionalism, knowledge, understanding, and customer service is really what sealed the deal and confirmed this was the right decision. He understood the importance of getting it fixed.. and getting it fixed right. And even though it was a convoluted mess after 6 IT people at GoDaddy worked on it, he pulled through and worked out all the kinks. Such a life savor!! We are forever grateful for him! Would highly recommend him to anyone. Jim is GREAT. Quick and affordable. I learned a wealth of info a short amount of time. Hopefully will never need his services again, and if I do I know exactly who to contact. Jim is.... AMAZING. Quick, efficient, affordable and clear in his communications. He had our hacked WordPress library site clean and tidy and back in business in no time, and had great recommendations for ongoing use and security. I'd enthusiastically recommend Jim and hackrepair to anyone... I already have. Thanks Jim! Jim was very helpful and spent a lot of time helping me with a website that I am locked out of. Appreciate his knowledge and patience! Jim was super easy to work with and had my site back up and running. He kept in informed throughout the entire process. He is honest and I highly recommend his services! Thanks again. I appreciate you! Jim is simply the best. I have used him several times for my clients' compromised websites and have had great results both times. Great communication, fast and thorough service. I will continue to use and recommend Jim! Great service! Our website was completely compromised. Jim responded incredibly quickly, started working on it straight away and solved the issue providing constant updates and valuable advice in the process. As advertised the service was effective, rapid and at a definitely lower price than other alternatives. Jim was also very proactive in not just solving the problem but also sharing what work he was doing and suggestions on how to avoid similar situation in the future. Definitely recommended! Jim was easy to work with and quick to respond to all of my issues and questions. Cherry on top was that he never made me feel less-than for needing any extra explanation for what was going on or how he was helping. Paying for his help was WELL worth the peace of mind. I used Jim back in July and I would certainly use him again. Having your websites hacked is a bummer, but Jim will get you up and running in no time! I found Jim Walker during my deep digging and researching after I was hacked. When I dialed Jim’s number he personally answered my call, listened to my situation, and discussed the easiest approach to solving my issue. Right then and there, with no agreement in place, he patiently walked me through the steps as I performed them under his direction. What an incredible breath of fresh air! Not only was Jim personable and extremely knowledgeable, but he immediately instilled all the confidence in the world in me that he is the security partner I want to work with going forward. Having cancelled my agreement with SiteLock due to their unethical upselling approach, I am now extremely happy to have Jim monitoring my website. I’m so thankful I’ve found him and I look forward to eventually moving my website over to his hosting platform. Thank you so much Jim! You’re the best! I couldn't be more impressed with the service we received from Jim. He had our site back up and running in no time! Jim is a lifesaver. Seriously! I was in trouble with several websites hacked on one account. I am so glad that he is the one I called for help. Not only did he start working on it within minutes of my call, he worked late and then again early in the morning. He gave timely updates often. One of my badly hacked websites I told him it was ok if it was hopeless. He decided he was going to save it no matter what! And he did!!! Jim is straight business and he is dedicated to his service. His fee is very reasonable - and worth every penny! THANK YOU JIM! Jim was awesome to work with getting my company's hacked site back up and running. I tried to fix it my self for a couple weeks and he had it up and running with in a day of me reaching out to him. He also gave me a list of things to do to prevent this kind of hack from happening again. Jim is the best! I needed to get a group of sites cleaned up back in March and within a couple hours Jim had us back on our feet. Customer service is second to none, he really does care about getting the bad guys out and keeping them out! Jim was amazing!! I had a bad hack on my site, and after searching around I discovered Jim. Jim went in and not only cleaned the site up of all hacks and malware, but he also taught me how to protect myself from future hacks and also a TON of website optimization tools to help with my SEO and the like. He was incredibly professional and very personable, and made me feel like I was working with someone who really cared about my customer service experience. If I ever have an issue again, I'll definitely be coming back to Jim! Here's the story: I don't do websites. Period. I know nothing about them, I don't code them, I don't fix them, but I use them every single day. So, when I got note that my business website had been hacked over and a pharmaceutical company was using it, I went into full panic mode. What the heck was I supposed to do? Thankfully, Google sent me almost directly to Jim. I called him right away. He answered in 2 rings and immediately put me at ease. He used just enough website lingo so that I knew what he was talking about but not so much that I felt like he was trying to pull one over on me just by making me think he knew what he was talking about. Within five minutes, even before I paid the invoice, he had redirected the site. Within a few hours he had fixed the entire site, told me exactly what he had done and sent me a full follow-up email. Bottom line, this guy knows what he's doing. And he does it well. If you don't know what you're doing, he does. I'm so grateful he answered the phone today! Simply put, Jim is the man! In the shark-infested waters we enter into as virtual value creators Jim is a much-needed sail-boat captain who will navigate you towards success. He's astute, curious, calm, and strategic in his understanding of how to resolve whatever issue you are having. If you are having any website security related issues look no further, this is your guy. No drama, no unnecessary paperwork or nonsense...just solutions...and at the rapid! Couldn't be happier and I recommend him with extreme enthusiasm. He's a consummate professional. Thanks Jim! I have used Jim's service twice. Both times, he not only fixed the website - while others told me that the sites were trashed and could not be fixed, he completed it in an extremely timely manner with top notch customer service. I HIGHLY recommend his services. Working with Jim is easy - unlike many of the other services out there that hit you with a set of fees depending on what may be wrong. Both times, Jim charged the same fee and resolved the issues within 2 hours. I highly recommend Jim's services! The level of service provided by Jim Walker is beyond words. You can read all these glowing reviews and actually be turned away by them thinking it is not possible or real. Page after page of 5 star reviews, in this case, may actually understate the dedication to doing the job quickly and right you will get with Jim. Very simply put, and without any payment or reimbursement sent my way, let me be clear: If you choose anyone else to work with, you are making a mistake. Excellent services. Jim knows his stuff and was very responsive, professional and had a wealth of knowledge. He got my sites back up and running and the communication back and forth was amazing. He cleaned everything and set my sites back on the road to success and a very good price. Great value! I cannot recommend his services enough. All I can say is Jim is the real deal. He delivers what he promises...and fast! He solved my hacking issue soon after I spoke with him on the phone. He was very thorough and kept me abreast of his progress until the problem was resolved completely. It was a pleasure doing business with him and would recommend him in a second! I rarely leave reviews on anything online but had to leave one for Jim. I was having a major headache with my sites and they were all down and my host couldn't help me. He got them back in a matter of hours and was great to deal with. HIGHLY RECOMMEND!!! Jim took care of my hacking problem in hours. I was amazed and impressed. He's a professional, brilliant, computer person.Thanks, Jim! My web hosting company said, "there are other companies that do this but..." and then went back and forth with the manager to get me a better deal on cleaning up three sites that were hacked. A quick google search brought me to Jim. My sites were cleaned, protected and back up on the web-better than before - for 1/5 the cost I was quoted. Thank you!!! I've turned to Jim for 2 different site hacks, and he's always been super quick to not only clear things up, but also provide steps for better security. Each time he has jumped in immediately and cleaned things up. He provides a thorough report as he's working through the issues so I always knew what had been found, handled and what was next. Thanks Jim! Very quick, responsive, and professional. Jim is great at what he does and if you have been hacked, you can trust him to help. How wonderful to work with a human! And what a relief to have someone extremely capable taking care of a nightmare. Jim is the real thing, don't waste your time with any other solution. Jim did an amazing job fixing all 5 of my Wordpress sites that were hacked. I was freaking out! Jim quickly fixed the issues within 24 hours and implemented processes for me to prevent this from happening again. I also really appreciate how he was able to explain what happened in simple terms so I understood. I highly recommend Jim! Our website was hacked. Pretty seriously compromised. Within hours Jim had everything fixed and back to normal PLUS had put extra measures in place to make sure we are secure moving forward. Thanks! Jim is so amazing! I found him thanks to a random google search. He answered the phone right away. He was so kind, patient, and helpful from the moment we started the conversation...even before money was exchanged. He fixed the issue I had right away and kept me informed throughout the entire process. Thank you Jim for everything! Jim fixed my hacked sites within a few hours! I got no real help from my hosting company at all - they just deactivated my sites and kept saying it was my problem to fix. Jim was so helpful and patient and gave me a whole list of things to do to protect myself in future. Thank you! Like the others on this page said, Jim absolutely saved the day for our business. What I thought was a hack ended up being a very stupid mistake on our host's end, but at the time, I didn't know this. Jim answered the phone immediately, worked on it and had the website up and running SO fast. His response time is amazing and is honestly one of the best professionals I have worked with. So much so, I had to leave a review -- something I rarely do. Thanks again, Jim! The service Jim Walker’s company (aka The Hack Repair Guy) provided was timely, affordable and thorough. I had an issue with a client’s website that was investigated and corrected within a few hours. Jim is very courteous, imparts knowledge and followed up consistently throughout the process and following days to ensure I knew exactly what was going on and what to do as a final step. Wholeheartedly recommend this company. I had 3 websites that were shut down because somehow hackers were adding malicious php scripts into my sites. Yep, I got hacked. Here's what impressed me with HackRepair and Jim. 1. Personal Service. This was the biggest and best surprise. I got direct phone calls, emails, and reassurances all along the way as my sites were being fixed and cleaned. 2. Easy To Follow Guidance. As my sites got back to normal, I needed some direction on what I should do next, how to keep my sites safe, and more. the email directions were clear and easy. 3. The Price! I'm not saying it's "cheap" but the fees were incredibly reasonable for what I received. Other similar services quoted me upwards of $600 for 3 websites, which is ridiculous. I feel like I received more than I paid for. I highly recommend the services at HackRepair. You won't be disappointed! We had all five of our sites hacked. Jim had them back up in what felt like only minutes. He updated everything and made it secure. I hope I never get hacked again, but I know where to go if I do. Jim has done a great job helping with removing Malware from some of our sites. Quickly and Expertly! Virus Gone. OMG Jim saved my life! All five of my websites were hacked and my service provider was of little help. They offered no apologies and simply referred me to a company they are partners with to fix it, who subsequently tried to sell me an outrageously expensive plan - suspicious (one I almost had to go for because I did not have time to be dealing with this.) Anyway after a quick google search I found a blogger who recommended Jim and after talking to him for all of about 5 seconds I realized I could breathe again. I literally handed my problem to him and he took care of it for half the charge and half the speed and he communicated clearly with me through every step of the process. I honestly can't recommend him enough. I was so grateful to have an actual caring human willing to walk me through these types of problems that I went the extra step and moved all my sites to his service instead. I now feel safe. Thanks Jim! I found HackRepair through an internet search when I had lost two websites but had enough to pay for the restoration of only one. Jim himself answered the phone and began exploring the problem immediately. Within minutes he had me convinced that he really knew what he was talking about and could do the job. The price of $279 I knew was reasonable from other services I had already investigated, and I hired him on the spot. He continued to work for the next several hours and send me regular email updates as to what was happening on the one website I had hired him for. Then, to my surprise, he offered to fix the second website for no extra charge! Everything is completely back up to working order, and Jim even did updates and installed some necessary backup and security plugins. I'm extremely pleased with his work, his willingness to go above and beyond what I hired him for, and his kind and professional manner. I would recommend him in a heartbeat. Jim is the best! He answers the phone immediately, is so professional, and gets the job done quickly, effectively and efficiently! I highly recommend him to any business owner looking for web security for their website. I can always rely on him to provide excellent service! After noticing my website disappearing and realizing it had been hacked , I luckily found Jim. He jumped immediately onto the problem and fixed it almost immediately - I can't say enough about his expertise and help he has provided. The personal attention, educational approach and experience in my opinion is huge . Thank you Mike for sharing your knowledge with me in regard to my hacked server. These culprits are becoming more of a threat to our website's security and thank goodness we have warriors like you to repair damage they have done and firewall their hack-minded efforts to destroy what is not theirs. I am a WordPress developer and I maintain my own dedicated server for my clients. I was in a major jam when my previous server provider stopped updating or patching my server. Next thing you know my server is being hijacked by hackers to send spam email from my clients accounts! I was so upset and tried to get some help from my providers who just blew me off. Google was blacklisting websites and my entire email server and all email accounts. You can imagine how well that went over with my clients. I had already worked with Jim Walker - HackRepair on a couple of projects so I gave him a call. I explained what was going on and without any hesitation he offered to help. He asked for my server login and within a half hour the spam relay and been disabled and the vulnerability that allowed it to happen had been fixed. You can imagine my relief to have some help with such a critical issue for my Business! By the next morning all of my accounts were un blacklisted from Google search, and our emails were going out without any problems. After all of this I decided to switch my server to Jim's hosting service. That was several years ago and we have had a few issues here and there that were all handled in a friendly and fast manor. I always get an answer to emails within minutes and I am not left hanging. I highly recommend Jim Walker and HackRepair to anyone who needs help cleaning up a hack. I would also highly recommend TVCNET for anyone who needs a secure environment for hosting and growing your business.